TUW is delighted to report that the stage play "Magic Number Six" completed its run at the Edinburgh Fringe to much success and good reviews during August 2013. 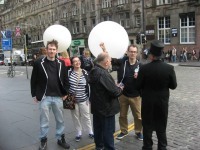 Cast and crew could be found promoting the show (left) during the run, which writer Paul Gosling told us "went well and played to a mixture of Prisoner fans and curious theatre-goers. It was well received." Paul was also interviewed on BBC Radio HERE (at 1.51'.10") following his appearance at the BFI HERE. The play, which tells the story of Patrick McGoohan and Lew Grade's relationship during the making of "The Prisoner" comes highly regarded by TUW (review HERE) and it is hoped that other performances in one form or another will take place in the future. With thanks to Paul Gosling for this news item and photo.